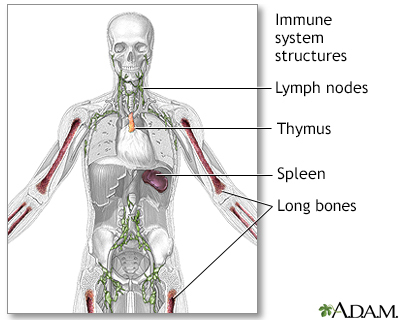 Your immune system helps protect your body from foreign or harmful substances. Examples are bacteria, viruses, toxins, cancer cells, and blood or tissues from another person. The immune system makes cells and antibodies that destroy these harmful substances. The immune system becomes slower to respond. This increases your risk of getting sick. Flu shots or other vaccines may not work as well or protect you for as long as expected. An autoimmune disorder may develop. This is a disease in which the immune system mistakenly attacks and destroys healthy body tissues. Your body may heal more slowly. There are fewer immune cells in the body to bring about healing. The immune system's ability to detect and correct cell defects also declines. This can result in an increased risk of cancer. Get the flu and pneumonia vaccines, and any other vaccines your health care provider recommends. Get plenty of exercise. Exercise helps boost your immune system. Eat healthy foods. Good nutrition keeps your immune system strong. DO NOT smoke. Smoking weakens your immune system. Limit your intake of alcohol. Ask your provider how much alcohol is safe for you. Look into safety measures to prevent falls and injuries. A weak immune system can slow healing. McDevitt MA. Aging and the blood. In: Fillit HM, Rockwood K, Young J, eds. Brocklehurst's Textbook of Geriatric Medicine and Gerontology. 8th ed. Philadelphia, PA: Elsevier; 2017:chap 24. Tummala MK, Taub DD, Ershler WB. Clinical immunology: immune senescence and the acquired immune deficiency of aging In: Fillit HM, Rockwood K, Young J, eds. Brocklehurst's Textbook of Geriatric Medicine and Gerontology. 8th ed. Philadelphia, PA: Elsevier; 2017:chap 93. The immune system protects the body from potentially harmful substances. The inflammatory response (inflammation) is part of innate immunity. It occurs when tissues are injured by bacteria, trauma, toxins, heat, or any other cause.